Beyond The Spectrum is a candid, captivating film about autism that pushes you to think and see in different ways. It follows parents Carly Harnadek and Stef Pronk when they take a year off to do therapy with their son Oskar, who was diagnosed with severe autism at age two. Oskar has a twin sister, Izzy, and three other siblings, including older brother Ted, who has autism. 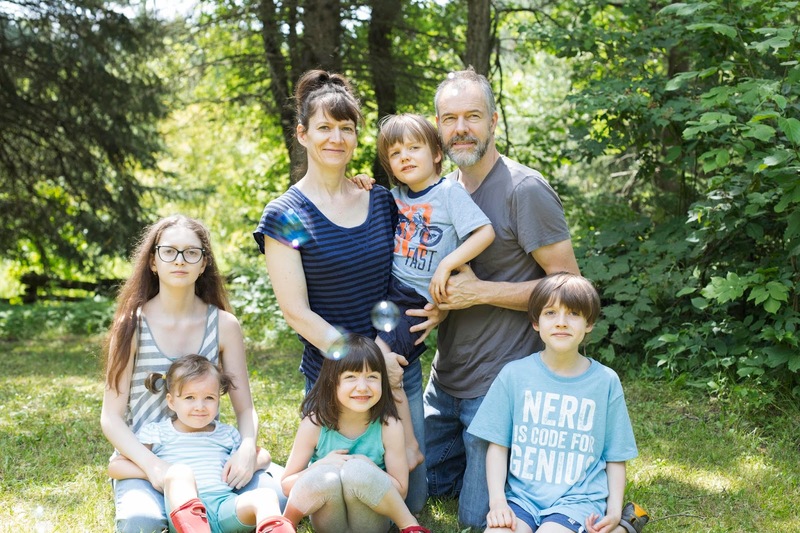 The family lives in Simcoe County and homeschools their children. BLOOM spoke with Carly to learn more about why they made the film. Beyond The Spectrum is directed by Steven Suderman and can be watched in its entirety on TVO at the link above. BLOOM: Can you tell us a bit about Oskar now? Carly Harnadek: He turned five last month and he still enjoys his books and playing with toys, some of which aren’t age appropriate. He loves being outside—anything involving slides and swings and being in nature. He loves going for walks, walks in the river, and car rides. He likes hanging out with his siblings. He more observes them still—there are four of them. He’s finding his place in the family now, and coming into his own, and we’re waiting to see where his interests lie. Unfortunately, his expressive language is still slow. He has good days when he can use single words for his needs. He has over 50 words. Mostly nouns and verbs from all of the labeling we do as parents. The words don’t always seem to come. BLOOM: Does he communicate in other ways? Carly Harnadek: He’s getting better with direction and pointing and in some ways, we know him really well. We speak Oskar. BLOOM: You can interpret him. Carly Harnadek: Yes. His receptive language is really good. As soon as you say ‘did you want to go outside?’ he’s at the door, or ‘are you hungry’ and he’s in the kitchen. BLOOM: It’s unusual for two parents to take a year off to work with a child. Carly Harnadek: I’m not going to recommend it, unless you have a money tree in your backyard. You see me at the beginning of the film calling about respite and Intensive Behavioural Intervention (IBI) and Applied Behavioural Intervention (ABA), and everything has a wait list. BLOOM: Yes, I remember in one case you’re told it will be a three-year wait. Carly Harnadek: That was for IBI. We live in Simcoe County, which was one of the most underfunded at the time. I thought, do I fight the system and see where we get? It was a crap shoot. I thought we can spend all that time and energy and money, or we can do it in reverse. You don’t have the income, but you’re not paying for all of the supports. I needed to know that Oskar was getting the support and I wasn’t wasting my time with paperwork, I was spending it with Oskar. My husband has his own business and we were homeschooling. Of course it’s something you can only do for so long. It was a gamble, to see how far we could get in a year. There’s been a bit of a backlash, with some people feeling I’m saying parents shouldn’t do IBI, when there’s so much advocacy here about getting it and the wait lists. My thing is there should be choice. It’s not a one-size-fits-all approach. When Ted was diagnosed with autism we were living in the U.S., and we learned about all of these different therapies. Behavioural-type therapy like IBI is what’s touted here, but it’s not necessarily everywhere. We were told that for very young children, play therapy was the best. And Teddy made huge gains with it. BLOOM: Is that the Floortime approach? Carly Harnadek: The program we used was called Communicating Partners, but it had its roots in Floortime. BLOOM: In addition to play-based therapy, what were the other things you did with Oskar? Carly Harnadek: We did biomedical treatment, so Oskar had a gluten and casein-free diet, and then we removed other things like sugar. He did sensory integration therapy and astronaut training and therapeutic listening. BLOOM: In the early part of the film, Stef expresses hope that Oskar will catch up to his twin Izzy. What were advantages, or disadvantages, of Oskar having a twin, or his older brother Ted with autism, in terms of how you understood Oskar? Carly Harnadek: In the beginning of the film, you see how one child is progressing along the standard milestones, and the other child isn’t. Even later, when Oskar did certain things like crawling or walking, he never did them to perfection like Izzy did. This keeps building, and he ends up getting farther and farther behind. Even though Oskar and his brother Ted present differently, having Ted gave me hope for what can be, and it also reinforced how important it is to really observe your child. The more you know your child, the better you can advocate for them. BLOOM: When I was watching the film, I was thinking that as a parent it would be hard to have one twin speeding ahead and the other not. Carly Harnadek: It is hard, you’re totally right, as Izzy gets older and older and does more and more. On the other hand, she’s an excellent modeler and Oskar really watches her. As parents, it can be hard with twins, because you have that feeling that one has gotten all of the extra attention—good or bad. But because Izzy has older siblings, they act as surrogate parents as well. BLOOM: Can you describe the tension between you and Stef around whether Oskar’s autism needs to be accepted or changed? I think that’s a universal theme for parents raising children with any disability. At one point in the film, you liken it to parents who try to turn their gay son straight. Carly Harnadek: Stef and I do come at autism differently. Ted is not Stef’s biological son. My first husband passed away, so that was a journey I had with another partner. 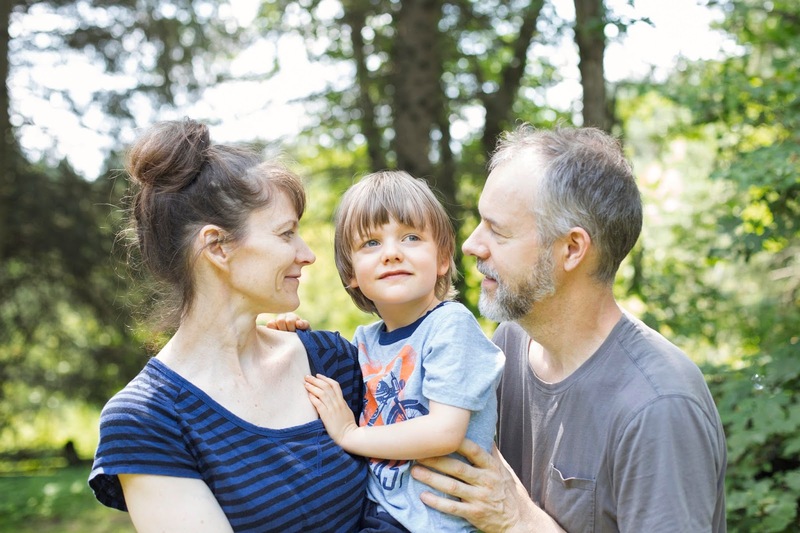 To me, my boys' brains are wired differently from the start, and it’s a part of who they are. Stef feels more that things have happened to Oskar, so you’re looking at trying to fix or undo something. BLOOM: Where do you and Stef sit now? Carly Harnadek: We still have the same sort of feelings. I feel it is a part of who my boys are, and that society can label it however they want. Stef still feels it’s something that happened post-delivery. I’ve been in it longer, and met a variety of kids and adults with autism, and I know this is a really long journey. It will unfold however it will unfold. Stef's benchmark was Ted, so he saw it as a shorter journey. Stef was always the newer parent and I was the longer-journey parent. But we’re meeting amazing families and kids and over the years your perspective changes and evolves. BLOOM: In the film, Stef is very focused on speech. BLOOM: One of the adults with autism in the film makes the point that many stimming behaviours are a way for an autistic person to calm themselves, so they’re adaptive. But because of our social norms, they’re not acceptable. Carly Harnadek: First of all, it was amazing to have adults on the spectrum acting as the voice of reason through the film. I feel so much that as parents we can learn from adults or teens that have experienced the journey firsthand. Last year, Oskar went through a really rough six months where he was shredding paper like crazy—books and everything. If we had said ‘no shredding paper’ and focused on the behaviour, and eliminated it, we wouldn’t have gotten to the root of the problem, which ended up being inflammation issues. BLOOM: At one point in the film Stef says that the work you do with Oskar could mean the difference between him being independent one day or institutionalized. Carly Harnadek: I think for us, that was part of why we took the year off. We thought ‘why are we going to rely on professionals and the system to help our child—when they get around to it—when we can take the reins and say we’ll do whatever we can?’ It was a waiting game that we didn’t want to play. 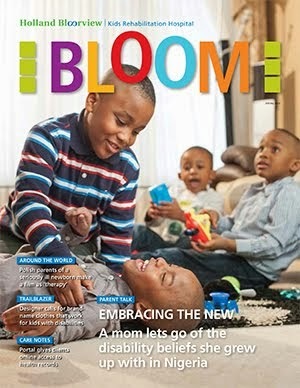 BLOOM: When I was raising my son with disabilities, I think I felt like I had control over his outcome. And it was really hard for me to acknowledge, during his teen years, that I didn’t. I thought that if I worked hard enough and did all of the therapies and went to the moon and back for him, he would make a certain kind of progress. Carly Harnadek: At the end of the day, I think we need to be able to say that we did the best we could, at that time. I think of Joseph Campbell, who says ‘You have to give up the life you were planning in order to have the life that is waiting for you.' The people you meet and the experiences you have with a child with special needs, you can’t get that with neurotypical children. After my first husband passed away, I realized life is short. You don’t know how much time you have. If you can live every day to the best of your abilities in that moment, and really cherish those little things, I feel at the end of the day you will live a life worth living. That’s what I’m trying to do for all of my kids. With the autism and the homeschooling, I feel I’m on this path of life that yeah, sure is hard at times, and harder than living conventional, but it’s so much more enriched. You meet people, and I tend to have conversations with people, that I don’t think I ever would have had otherwise. BLOOM: You get more real. Carly Harnadek: Yes. You have to almost walk the path. That’s why we started our website The Muddy Path. We’re not walking on the sidewalk, with the majority of people. BLOOM: How did the idea for the film come about? Our idea was to have a bunch of families with different kids with special needs. We wanted to show how much effort and support is needed to raise a child with special needs—to create your village. We contacted Steve Suderman and took him some footage we’d taken as an example. He sent it to TVO. Then they decided to just focus on one family and follow the story for a year. Being a little bit cocky, and naïve of what the process would be, we said yes. Steve came every three weeks and would stay from three to five days—the longest was seven. He stayed at a hotel or B and B, and he came every day at breakfast and stayed into the evening, sometimes till 11 at night. He wanted us to rehash the day, so we had to wait till the kids were in bed. He took over 250 hours of film. BLOOM: Wasn’t it hard to have a camera in your house during such intense periods? I’m just thinking of how I often felt like parenting a child with a disability showed up all of my inadequacies. Carly Harnadek: That’s why we needed a break after we’d been filming for four months. Things weren't going well and the kids were frustrated. I felt like this massive failure and hypocrite. I felt I was going to be this huge let-down to parents. We got worried about what Steve was going to show. Was he going to show us as these failures who didn’t want to get services for their kid? What did that mean for our family? The questions Steve asked us were quite private, and the discussions Stef and I had were the kind you’d have only with your spouse. While we took time off, Steve sent us footage of things he’d been working on and told us about research he’d been doing. He’d been reading NeuroTribes. Carly Harnadek: Yes. We were all reading his book and were inspired by it. We had huge discussions about it, and we decided we wanted to bring some of these things into the film. The break gave us a time to say that we wanted to change some things up, and we regained our confidence. A small group of parents feel that we're these privileged people who can take time off work: 'Who do they think they are—super parents?' They take the film as a recipe. That wasn't the point at all. We couldn't maintain that. Parents do need support. They do need to have a village to help with their child. You do need to have a coffee, so you can decompress because you just lost it. I think most parents will in some way connect with us as a family. It is a daily struggle. You don't know what you're doing. As Stef says, you don't know if you have a road map. You're shoved into the abyss to figure it out for yourself. There's that initial fear of how am I going to do this? I can't do that. BLOOM: At the end of the year, your thoughts on what's important about communication change. Can you explain? Carly Harnadek: In the beginning, my biggest fear was that I couldn't connect with Oskar. Even though I could still squeeze him and give him a hug, because he didn't have high sensitivity to touch, I wanted to know that he knew that I was his mother, whether he could say it or not. At a certain point in the film, I said I didn't want him to be this talking robot. Ted always feels that he can come to me if he needs a hug or wants to be understood. And I wanted that for Oskar. The bigger goal was to know that Oskar and his mom had sort of found each other. BLOOM: What did you think when you first saw the movie? Carly Harnadek: I got to relive it, but as an outsider. I was always doubting myself. How much am I doing? And all of these mother guilt things. I think for me, when I got to the end of the film, I could say yes, I am doing a pretty good job. there is a boy, a few years older than Oskar, who shreds paper all over the house and everywhere else. Made me wonder about inflammation. Liked the way you went on all the paths and found and discovered and explored. Thank you for doing this movie. It does help parents. I really admire that you followed what you believed was best for your son. We have done the same. We all wonder if we could be doing more or if we did things right. It's a terrible pressure. But you can't ever get the early years back and watching our son develop has been the greatest joy so I do like that you show that spending time getting to know your child is what's most important--and that it's hard and support is required. I really hope this leads to our government funding choices for parents because there are other evidence-based approaches that work as well and better than ABA. Kudos to you and your family. I watched this documentary several times and was struck by the manner in which Oskar is so supremely aware of his hands, as well as his dexterity. Perhaps sign language would be an option to communicate with him.